View Kim’s Messages from the 2007 Iditarod by Clicking Here! Kim’s journal and photographs highlight Kim’s journey along the Iditarod Trail during the race. Meet Jack, the Wells Fargo mascot and identify his location as he travels from Anchorage to Nome. View Kim’s ‘One Square’ project and be inspired to start your own similar project. One Small Square : Discover what you can find in one square and compare this to your own environment. This lesson can be used for any grade level and integrated into any content area. Iditarod T-Shirt Shop: This lesson is geared for students in middle school/high school. Students become entrepreneurs by designing and marketing an Iditarod T-shirt in a mock economics activity. Iditarod Stem and Leaf: Students display musher data using a stem-and-leaf plot and find data landmarks. How Much Is Iditarod Worth? Students use Iditarod vocabulary and attach a money value to each letter in the alphabet to calculate how much the word is worth. Iditarod Dog Bone Math: Students use dog bones to measure (non-standard measurement) various object in the classroom and to estimate. Alaskan Beanie Classification Lesson: Students classify animals that live in their area and in Alaska using a Venn Diagram to compare and contrast characteristics. Iditarod Billboards Lesson: After studying advertisements, students create imaginary billboards advertising make-believe products that could be sold to mushers. Husky Number Line: Create Iditarod husky number lines and let these adorable huskies help students learn to add, subtract, and multiply. Inside the Iditarod: Students will summarize Press Release from the Iditarod website by utilizing the 5 W’s strategy. Arctic Days: After reading the book Arctic Lights: Arctic Nights, students will track and record times for sunrise, sunset, as well as the average high/low temperatures on the twenty-first of each month. They will create models in order to examine the relationship the earth and sun have on seasonal change and the length of day. Famous Sled Dogs Students will compare and contrast two sled dogs, Balto and Togo, using literature and mathematics. Weather Watch: Students will collect data around the country including Alaska, Florida, and their state and then draw conclusions about the climate of these areas. Iditarod Passport Students will embark on an imaginary tour of the United States (Florida, Alaska, and their own state). In their travels, they will be learning about the various locations they will be visiting. 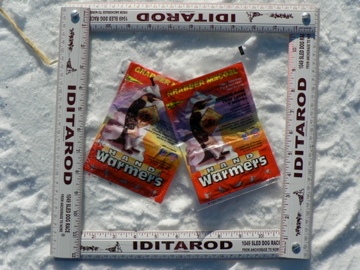 View Kim’s Teaching Tool for Iditarod Math Lessons by Clicking Here! View Kim’s Monthly Newsletters: Click the title of Each Newsletter to view! The 2006 Summer Conference newsletter summarizes events that took place during the 2006 Summer Conference for Educators. Meet the participants and the guest speakers. Posted by Kim Slade, 2007 Iditarod Teacher on the Trail™. Trail Tales – September introduces readers to Kim’s dog, Kenai and shares information about the topic, adaptations. Posted by Kim Slade, 2007 Iditarod Teacher on the Trail™. Trail Tales – October provides information about the book The book Arctic Lights: Arctic Nights by Debbie S. Miller with Illustrations by Jon Van Zyle, and opens the conversation with students about the length of the day – hours of daylight and darkness. Posted by Kim Slade, 2007 Iditarod Teacher on the Trail™. Trail Tales – November: Where do dogs sleep? This newsletter provides information and an activity about creating dog houses. Posted by Kim Slade, 2007 Iditarod Teacher on the Trail™. Trail Tales – December, (posted December 30, 2006). Kim Prepares to head out on the Iditarod Trail! Click here for a copy of all of Kim’s Newsletters. “From sea to shining sea…” from the Atlantic to the Pacific Ocean; from the Gulf of Mexico to the Bering Sea; we are all connected by one amazing thing – the Iditarod! As the 2007 Wells Fargo Teacher on the Trail, I plan to show the many connections that can be seen from one part of the country to another. These links are like pieces of a puzzle that, when put together, can help children make sense of their surroundings. I plan to share various ways that the Iditarod Trail Sled Dog Race can help make these valuable connections visible to children across America, as well as across the world. Educators are constantly trying to find ways to reach children in the classroom. Research has shown when teachers employ real-world situations within the classroom, student gains are greater. The Iditarod provides a foundation to explore learning in this world, and by immersing our students in this unique learning environment; we set our classes up for a win-win situation. My goal is to provide activities that utilize the spirit of the race, shows the character of the people, and mettle of the athletes! Students, teachers, parents, and race fans can look forward to active learning lessons that I will be posting monthly. With themes such as, No “I” in Team, Where in the World?, Weather Watch, Doggie De-tails, Snowflake Science, and Alaskan Appetite, you’ll never look at learning the same way. Embark with me on my journey that will take us all from one ocean to the other comparing, contrasting, and fitting the educational pieces together using the Iditarod Trail Sled Dog Race!